Lorenzo E. Salazar (1924 – 1991) was the sixth Bishop President of the Apostolic Assembly. He is the only one to have been a veteran and the first missionary to become Bishop President. Born April 1, 1924 his mother came to the Apostolic faith at brother Nava’s church when he was still young, he practically grew up in the Assembly. He left the church, but after tasting the world renounced it, and was baptized in 1944. Soon after, he served in the military during the Second World War. After his return he soon went to the missionary field in El Salvador and Nicaragua from 1951 to 1955. During his time as missionary he met and married sister Crucita Gaitán in 1953. He served as Secretary of Missions and Bishop of the new Los Angeles District. In 1970 he would be elected Bishop President. His presidency brought stability after a decade of changes; he organized the first Pastoral retreats and legislative congresses. During his tenure, missionaries were sent to Spain and the Caribbean. 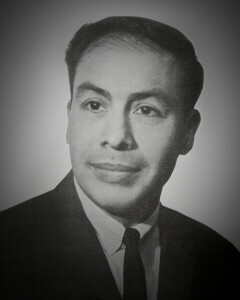 Bishop Salazar was the first President to graduate with a theological degree, a Master of Divinity (M. Div.) from Fuller Theological Seminary. Lastly, he is the greatest Apostolic Assembly hymn writer after Marcial de la Cruz; among his hymns are “Fuente de Misericordia” and “Los Diez Mandamientos.” He died surrounded by family on September 23, 1991 in La Mirada, California.